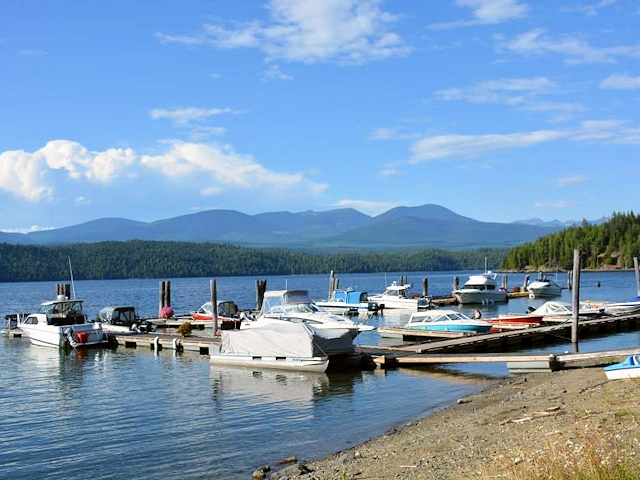 Plato Island Resort and Marina offers a marina on Quesnel Lake with well protected and maintained moorage for your boat. Quesnel Lake is a large, wilderness lake in the heart of the Cariboo Mountains. Our resort makes and excellent base camp to explore the many miles of secluded beaches and pristine wilderness. Wildlife viewing and trout fishing are popular activities. The fishing is spectacular and the fish are very large. Bring your boat and doc it at our marina. Daily moorage and seasonal moorage are available. A fish cleaning station is right on the docks and premium gas is available for your convenience. Seasonal: $8.50 per foot (overall length) per month based on a 5 months season, including trailer parking and vehicle. 1 vehicle per boat.